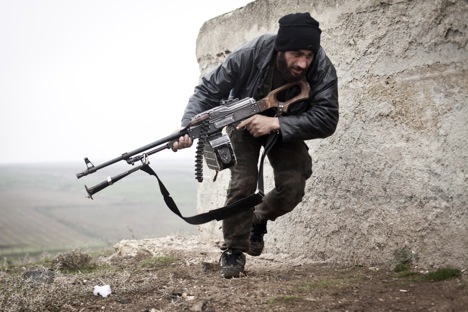 A Free Syrian Army fighter takes cover during fighting with the Syrian Army in Azaz, Syria. FSA leaders have been ready for dialogue with Moscow since the beginning of the civil war and have put forward proposals to send a high-level delegation to the Russian capital, FSA representative said. The Free Syrian Army is ready to establish contacts with the Russian leadership, Fahad Masri, a former official FSA representative and a coordinator of the Syrian opposition’s National Salvation Front, said Wednesday. The FSA is an armed Syrian opposition faction, considered "moderate opposition" by Western countries, fighting the regular Syrian army currently remaining loyal to President Bashar Assad since the beginning of a four-year civil war. On Monday, Russian Foreign Minister Sergei Lavrov said Moscow was prepared to contact the FSA and asked Washington for information regarding the group. "We welcome [Russia's readiness to establish contacts with the FSA] and do not object to the meetings with Russian officials, but on the condition of ceasing airstrikes on positions of FSA units and the civilian population," Masri said. He added that FSA leaders have been ready for dialogue with Moscow since the beginning of the civil war and have put forward proposals to send a high-level delegation to the Russian capital. Russia’s Sukhoi Su-25 fighter jets, Su-24M and Su-34 bombers, with the support of Su-30 Flanker jets, commenced precision airstrikes on Islamic State (IS) targets in Syria on September 30, following a request from Assad. Since the beginning of the campaign, the Russian Defense Ministry has stressed that Russian aircraft are fitted with equipment allowing them to conduct "absolutely precise" airstrikes against Islamic State throughout Syria, to evade civilian casualties. Last week, Syrian Ambassador to Russia Riad Haddad confirmed that Syrian Army strikes, supported by the Russian Air Force, were carried out against armed terrorist organizations and not political opposition factions or civilians.